Uses aftermarket 5-bolt senders. 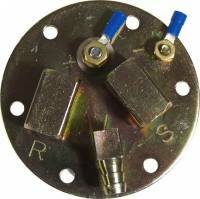 Multiple Ohm ranges available to work with factory or aftermarket gauges. EFI Style internal baffling. 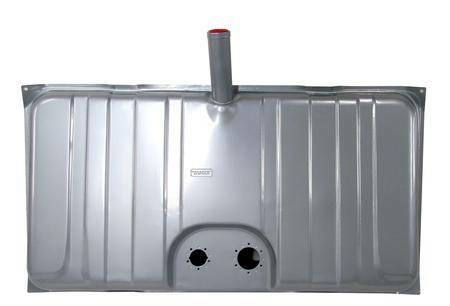 Extra large 4.3 liter internal fuel tray to prevent fuel pump starvation. 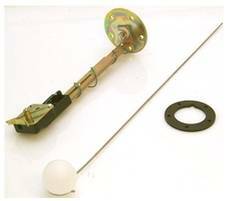 Fuel pump and sender is recessed in the tank for easy installation with no modification needed to your car. Looks Like and OE tank when installed in your car. Coated galvanized steel then Powder Coated Silver. 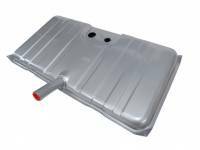 39-3/8" x 20-7/8" x 7-3/4"
The GPA-Series Fuel Pump Module is designed to be used in many of our die-stamped alloy-coated and stainless steel gas tanks that have factory-installed reservoir trays. The tray is an absolute necessity for fuel-injection in order to prevent fuel starvation when accelerating and cornering. The heavy 10-gauge no-warp mounting plate contains fittings for the supply, the return, the vent and the electrical connector. It is yellow-zinc plated to prevent corrosion. Our fuel tank sender mounts with five mounting screws. They work on fuel tanks from 6 to 24 inches deep by cutting to length using the instructions included. 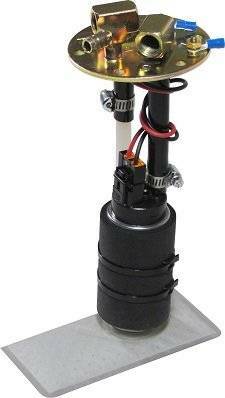 Since fuel tank senders only read resistance to ground they work on all 6-24 volt systems positive or negative ground. They do not have a fuel pickup tube built into them as some original senders may have. Made with a high quality ceramic board rheostat.